"When it comes to music, you can take my word as gospel", states legendary bassist Jeff Berlin. With Berlin's remarkable resume, how can you argue with that? Never one to shy away from controversy as it pertains to music education, Berlin has been backing up his no-holds-barred statements with demonstrations in classes at the Players School of Music, lesson articles, and in bass clinics around the world for the past three decades. While most bassists of the 1970's were busy trying to emulate Jaco or Stanley, Berlin was refining his own unique approach to bass playing. Few bassists have possessed his musical prowess and even fewer have displayed his unparalleled technical facility and advanced utilization of improvisation. Today, Berlin continues to be recognized by his peers as one of the finest bass soloists in the world and an outspoken educator at the forefront of music education. As the son of an opera-singing father and piano-playing mother, Berlin obtained an affection for classical music at a very early age in his Long Island, New York home. At age five, Berlin began a decade of violin studies. He soon became acknowledged as an award-winning soloist and member of chamber groups and orchestras at various recitals, competitions, and festivals. While in his early teens, Berlin began focusing his studies on electric bass while absorbing the sounds of the Beatles and other prominent rock groups of that era such as Cream. Shortly after high school, Berlin left New York and headed to Boston to study at the Berklee College of Music where he became heavily submerged in the sounds of jazz and influenced by faculty members and other students. Berlin left Berklee after a couple years and returned to New York for more on-the-job training where he soon appeared on live performances and recordings with some of the most highly-respected musicians of the day including Allan Holdsworth, Michael and Randy Brecker, Mike Stern, Pat Metheny, Tony Williams, Bill Evans, Toots Thielemans, Al Di Meola, and Herbie Mann to name only a few. In 1977, Berlin joined former Yes drummer Bill Bruford's band which featured guitarist Allan Holdsworth. As a member of Bruford's band, Berlin would record four widely-acclaimed projects. In the early 80's, Berlin relocated to Los Angeles to assist in the launch of the Bass Institute of Technology (B.I.T.) at Musicians Institute. During his decade spent in Los Angeles, Berlin played alongside some of the biggest players on the scene such as Frank Gambale, Scott Henderson, and Vinnie Colaiuta. In the mid-80's, Berlin released two projects under his own name, Champion and Pump It!. Both recordings produced historic bass tracks including Berlin's solo bass arrangement of "Dixie" (Champion) as well as "Bach" and a revisited rendition of "Crossroads" (Pump It!). Berlin left the chaotic lifestyle of Los Angeles in the early 90's to raise his family in the more serene atmosphere of Clearwater, Florida. Often maintaining what some people seem to perceive as controversial stances on issues surrounding music education, Berlin founded the Players School of Music in 1995 to introduce perfect, factual learning methods to musicians at any level. In 1997, Berlin released, Taking Notes, his third effort as a leader. Taking Notes featured some of Berlin's most eclectic work ever captured on tape along with two chordal bass workouts, an emotive version of Eric Clapton's "Tears In Heaven" and a solo bass arrangement of American classics titled "Clinton Country." Berlin's next offering as a solo artist came in 2001 with the release of In Harmony's Way, his most sophisticated project to date. In August 2004, Berlin released his latest solo project, a straight-ahead jazz recording titled Lumpy Jazz. In the interview that follows, Berlin discusses his latest solo endeavor, the Players School of Music, the state of music education, and much more! Tell us about your brand new release as a leader, Lumpy Jazz. Where can it be purchased? Lumpy Jazz is a straight-ahead jazz recording. Now that I've mastered it, it's a real interesting session to ponder in retrospect. It is a piano trio that produces more sound than any piano trio I have ever heard. It's straight-ahead jazz because we are all improvising. We play solos with the greatest of intensity that we can produce, and this is my favorite recording that we've done. The extended solos are the longest solos I've ever recorded. Plus, I think I've come up with something that I have never heard a bass player do before due to the fact that I'm playing with an upright bass player. In many of the tunes I take on a comping role similar to a jazz guitarist or jazz pianist, and I don't think I've ever heard that. In fact, there are a couple tunes where I don't venture below a low B (7th fret E-string). I'm staying high on the bass and comping. I filled a lot of the Wes Montgomery role while Richard Drexler took on Paul Chambers, and it really works well. What makes Lumpy Jazz especially unique is that I used a guitar amp instead of a bass amp when I recorded it and ran into the best bass tone I've ever put onto a record. There were also some problems that went along with it, but it was a new experience so I dealt with a whole new reality of bass playing due to the fact that most of the record was recorded through 2x10's. It was a little Peavey Studio Chorus amp. Because of the guitar amp element, the bass sound is slightly out of control in the fact that the tones are changing constantly. It was an amazing experience because the sound was as growly as any electric bass sound that I have ever heard. If I would move my hand one inch off the neck or touch another part of the string, the tone would change. I could be louder, I could be softer, I could have more bass sound in my solos, and I could have less bass. It was the most alive and slightly out of control bass sound I've ever recorded. It really weirded me out because I wasn't sure if that was going to be acceptable. I'll be playing a phrase and half way through the phrase there is more bottom, and then at the end of the phrase there is more top. This just came about because this amp was so responsive that it opened up an entirely new element for me. I think there is something here that has never been done before on a bass record. Each track has something a little different, and forgive the bravado, but I do think you are really going to hear some special stuff here. Back in the mid-80's on my first solo recording, Champion, I was afraid to do solos as a leader. I didn't think it was something that I should venture into so I gave solos to everybody else. Of course, later I reflected on that and came to the conclusion that it might not have been the best choice. I began to play catch up and basically hog as much space as I could but really because of the love of the instrument. I love to solo. I pursue it. I examine it in a way that is almost sacred. The great soloists have never been bass players. They have been other instrumentalists, and I want to know how they do it. The other members of the trio include Richard Drexler and Danny Gottlieb. Richard is a pianist and an upright bass player incidentally. 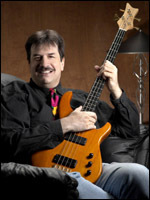 He is a virtuoso bass player and a virtuoso pianist from the Tampa Bay area. We've been playing together for several years. Danny Gottlieb is the great jazz drummer on this recording. We have one guest soloist, Toots Thielemans. I've known Toots since the 1970's. I have always called him Uncle Toots, and he refers to me as his nephew Jeff. When we started putting this record together, Richard and I thought that Toots would be a fantastic addition on one tune that we have titled "Toot's Suite." Lumpy Jazz is going to be available from my website because in my experience with record companies, they really don't support a lot of the bands that they sign. I noticed that when I released my last recording, In Harmony's Way, and put it out on my website, that I sold more cds of In Harmony's Way than I ever sold of any cd I ever did as a solo artist. People just went to the website, and the record was really one of the best recordings I had done so that just told me that selling my cds through my website was really the way to go. It will be available in July, and it will be announced on my website. How does Lumpy Jazz differ from your previous recordings as a leader? Lumpy Jazz is going to differ from anything I have done previously because it is a far more live and far more jazz recording than anything I've done. It is a pure representation of bass in a jazz trio setting that is live and at that moment, very spontaneous. It is the best bass playing I've ever put out on a record. End of story. It has tons of solos because that is where I tend to lean these days where I'm playing not so much melody as playing solos. As a very young child, you were recognized for your musical skills as an award-winning violinist. What lured you to the sound of the electric bass? I saw the Beatles when they played on the Ed Sullivan Show and didn't really think anything about it for awhile. After a period of time, it got underneath my skin. The Beatles' music was on the radio, and I just became a huge fan. I got into rock music through their contribution along with other bands that came along like Cream. Cream was a group that was the center of my musical life. They were a jazz group as Jack Bruce described them. Jack said they were a jazz trio, but they just didn't tell Eric (Clapton). In a sense that is true because they would play the head, then they would play for fifteen minutes, and then end with the head again. That is a jazz format - head, solos, head. Jack Bruce was the very first virtuoso on electric bass in modern music. 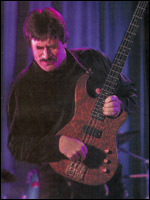 He was the very first bass player to take the instrument and present it in a uniquely solo/accompaniment format playing notes that were not typical for bass players, rhythms that were not typical, and that is evident on their live music, not their studio music. Jack Bruce is the one that even to this day I'll sometimes play something and think about Jack. Jaco's brother told me that Jaco had bought Songs For A Tailor (Jack Bruce's first solo recording) for his brother Rory's birthday. When Rory's birthday came, Jaco gave the record to Rory. When Rory opened the record, Jaco grabbed it and went to his room to check it out. Jaco was very influenced by Jack Bruce. In going from violin to bass, I saw the similarity between the strings. Violin from low to high is tuned G-D-A-E, and a bass low to high is just the opposite of that, E-A-D-G. Since I had put ten years into the violin, perhaps I could adapt some of the principles and make the bass function in a way that was unique. In an era when Jaco was a kid and a genius, I was around at the same time, but I wasn't a genius. I was just a highly motivated and curious guy with a lot of musical background. Since I wasn't born with the genius element that Jaco possessed, I had to really work for it. Everything that I've produced since has not been due to genius but rather due to the sweat off my brow. From the first week that I had a bass, I was trying to play a Mendelssohn violin concerto on it. It was odd, but I was always thinking that way when it came to my instrument. You have often cited Jack Bruce as one of your principal influences on bass. Who else had an impact on your development as a bass player? Nobody really influenced me as profoundly as Jack. Paul McCartney was an influence because I was so into Beatles' music. To this day, I regard McCartney as a good bass player, but he's really a songwriter/singer that also plays bass, guitar, and piano. We had Jack Casady of course who was very unique as a bass player. I think he was a very big influence on Anthony Jackson. Tim Bogert of Vanilla Fudge was grossly underrated. He influenced me almost as much as Jack, but Jack had that sound that I liked. Tim is one incredibly gifted bass player. Jack Bruce, Tim Bogert, Paul McCartney, and Jack Casady were all influences. I did listen to a lot of Tower of Power, and there were influences from Rocco because he's so astonishingly gifted. He's not a soloist, but the man has a groove. He's utterly unique and almost alone in his power as a bass player. The funny thing is that I've spent a large portion of my musical life editing out the influences that bass players had made upon me. If Jack Bruce had that kind of distortion and I employed it, it had to go. If Jaco played the fretless which I also imitated at an early stage of my life when I first heard him, I had to go back to frets. If Rocco played ostinato, single-note lines, I eliminated that from my bass playing. Anything that got to me had to go. I found that if I left that void from imitating people, I had to come up with something that wasn't there. That was my methodology of originality and coming up with unique bass playing. It's tough because you deny yourself what you like to do and what you do naturally. In terms of study materials, what would you suggest to a beginner? What did you focus the majority of your time studying as an up-and-coming bassist? What do you now enjoy practicing the most? If you are a beginner, the basic pursuits ought to be diatonic tonalities, reading simple rhythms, and learning the neck. It's really basic and simple. As musicians progress into these studies, you start to add various harmonic concepts, concepts that have nothing to do with bass but have to do with the fact that the concepts exist. In doing this the bass becomes a tool to represent the new concepts that you are studying - new chords, new lines, new tonalities. There is also the intensity of the desire to how you want to pursue your music. Many people have the intensity of wishing to play. They want to play, but they don't want to do the work to become players. This is the one element that seems to elude them so they subscribe to shortcut methods of learning, and they are really being taken for a ride. You can't tell a person who doesn't know about music that he is being taken because he doesn't have enough skills to realize it. A musician learning how to play has to first figure out how far they wish to go with it. If you want to be in a band, go get a teacher, take a lesson a week, buy some records, and imitate the records because every rock and blues bass player doesn't learn those styles in school. They learn by listening to records. No rock bass player that has ever been successful learned how to rock in a school. Rock education doesn't work. If a young musician wishes to play rock, buy records and hang out with rock players. If you want to pursue music at a higher level, then you need to seek out the musical sources that will teach you the instrument at that level of music. The way I learned at the beginning was by doing transcription. The first solo I transcribed was Chick Corea's "Light As A Feather." I could transcribe a solo like this because I already had all those years as a classically trained violinist. It wouldn't have been that easy if I didn't have that background. I've spent my whole life doing transcription. As a matter of fact, there is a Keith Jarrett solo of "What Is This Thing Called Love" that I transcribed which is sitting on my music stand right now. It's a ten-page solo, and I'm still practicing it because Keith Jarrett doesn't think like a bass player. I learn music that does not reflect the instrument but reflects the idea of the music. It's not the bass. It's the person holding the bass, and when I figured that out, my bass playing took off. What many people don't realize is that learning music is temporary. Learning music takes only a couple years, maybe four years tops if you go to a four-year music school. You can go to a school for only a year or two and learn music factually and then spend the next forty or fifty years honing your skills. Mechanics may go to the DeVry Institute, lawyers may go to Harvard, and as soon as they get out of school, they are fully involved in their field for the next fifty years. Studying is a temporary project. It begins and it ends, and everything that follows it is based upon the studies that you did earlier in your life. People have this idea that it is going to take them twenty years to learn how to read music. If it took me twenty years to learn how to read music, I never would have started. People think it takes twenty years to learn how to solo. If it took me twenty years to learn how to solo, I never would have started. Music does not take all that time. Studying music is a short term investigation. What follows is the developing and compounding of information and experience over many years. Why is a beginning driver scared out of his mind but a guy forty years old barely looks up anymore? The forty-year-old guy knows what is happening because of experience. You only need to go to driver's school for a few weeks. It's a process of refinement and it's fun. The reason there is a ten-page Keith Jarrett solo on my music stand is because of refinement. I don't know if I'm ever going to solo like Keith Jarrett, but I can tell you that I will solo better than any of my colleagues because I've been pursuing it. If you don't pursue higher goals in music, you won't play at a higher level of music. The musicians that play at a high level always fall short of their goals, every one of them. Within the head of the greatest virtuoso that you have ever heard in your life, that person is always thinking that they can play it better. In reality, the performance always falls short. If you learn high-level music and you fall into a medium range of performance, you are still better than everyone else that is still stuck in the lower levels of performance because they have never pursued anything else further. What people do in music is that they study intensely and then burn out. Instead, study 30-60 minutes per day of information-rich material spread out over five, six, or seven days of the week. After six months of doing this, you will be five times the bass player you currently are today. You take one vitamin a day. You don't take seven vitamins on Monday to carry you over to the next week begins. Today, I spend the majority of my time working on my new music and transcriptions. Transcriptions have really occupied a great portion of my practice time over the years because I'm learning music that I didn't think of and it is a great challenge to play that music on bass. I also practice playing accompaniment to my own lines where I play two or three lines at the same time, sustaining a note and playing lines underneath it. As a long-time student of world renowned jazz educator Charlie Banacos, how would you describe your experience with him? You are considered to be one of the world's finest bass soloists. When you are soloing, it seems like you never run out of ideas, and your phrasing sounds so incredibly fluid and lyrical. How do you approach improvisation? When you pick up your bass, you are continuing the legacy of the music that you played yesterday which was based upon the music that you played the day before which was also based upon the music that you played before that and so on all the way back to the first time that you picked up an instrument of any kind. The history and the pursuit of music always come out today. I've been playing music for a long time, but if I were to pick up a tennis racket to play tennis, I would miss the ball and my form would be awful because I don't have a history on the tennis court. Any decent tennis player at any age would run me literally all over the court with no problem. Why? They have played tennis for so long. When I solo, I'm basing that upon my entire forty-something years in music. You are hearing in a sense the result of all of those years of playing, studying, gigging, rehearsing, writing, and recording. When you put it all together in a blender, you are going to come up with a musical result, and that is the result that you hear in my playing. It is not a single thing. It's everything, and you can't grow unless you pursue it. It's not just the Keith Jarrett solo. It is the Keith Jarrett solo times 300. It's a result of all the bands and musicians that I've played with over the years. You have maintained strong opinions regarding the practice of certain bass techniques such as slapping and tapping as well as the usage of metronomes and tablature in music education. Would you mind sharing your thoughts on these subjects, and why do people seem so reluctant to accept your positions? People are emotionally connected to their opinions. If I believe that John Kerry is going to be a better president than George Bush and you believe that George Bush is going to be a better president than John Kerry, then you and I are going to fight about that. What you and I have not included in the argument is the truth. We haven't really considered if there is any truth to the fact that Bush may be better than Kerry at this and that Kerry might be better than Bush at that. When you tell musicians that all they believe in regards to how to play or how to learn isn't valid, they will want to kill you for it. There is a slight mob-mentality among musicians who get together and say, "I use a hand grip" and another guy says, "well, I use a hand grip too." When you have feelings about things such as metronomes, slapping, hand grips, and tablature, you are emotionally believing in these methods without a clearer, non-emotional investigation into whether or not these methods work. You are going to come up with an answer based on feelings and not proven facts. That is the reason why people flip out over these things. Metronomes don't teach you good time. Drum machines won't teach you good time. They'll keep a steady beat, and they can be used for that, but they won't give you good time. They have never given anyone good time. Most people have good time. The problem is that people don't know what to play. The music is the problem, not the time. The knowledge of your music and what you are performing is what allows you to have good time. You can't play what you don't know, and I've proven this time and time again in clinics that I've conducted around the world and at the Players School. Tablature doesn't exist in music. It is written for musicians who don't know the language of music that has existed for hundreds of years in standard notation. If someone can sit there and look at the numbers 15, 16, and 17 which will give them more of an immediate gratification rather than learning G, G#, and A, which way do you think they will choose? They'll choose the more immediate gratification. It's the fault of a lot of the magazines that promote tablature because they know that most of their readers don't know anything about music. Most of the readers of guitar magazines are fans which is fine, and they want to learn how Steve Vai did it. I say if you want to learn how Steve Vai did it, then toss a record on, put headphones on, and listen. That is how he did it. Billy Sheehan, one of the greatest rock bass players of all-time, he listened and he imitated. Tablature doesn't exist. It is a falsehood. It is a lie. It is the end of the development of a musician. Like this or not, it is a fact. A lot of people go after me on the internet, and I say watch out for these people because they don't know what they are talking about. They are opinionated and emotional about these things and don't have the skills or the musical knowledge to back up their statements. When you emotionally believe and emotionally attach yourself to a belief system without investigating it, it's going to mess up your musical progress, and you are going to pay a price for it later. Everyone is brave on the internet when posting to forums and message boards, and everyone is brave when writing a letter to a magazine criticizing me, but when it comes to a face-to-face confrontation, they are NEVER able to back up their beliefs. Let me emphasize something. I will sound like I am going to brag, but in music I am just about never wrong about these things. Everything else in life, you can take with a grain of salt because I'm not an expert in anything else. In music, not only do I know, but it has been proven a thousand times with Players School students. There's no doubt. There's none. Zero. You can believe it or not. It's up to you, but I will save you years of investigation and problems if you adjust your approach to learning how to play the instrument. In 1995 you founded the Players School of Music. How did that come about? My son Jason was sick, and I refused to play music until he got better. He was very thin, very underweight, and he developed cancer. He finally got cured, and now he is healthy and strong. It was very rough going. I didn't want to tour so I started the Players School of Music in order to make ends meet. The Players School was designed to introduce perfect, factual learning methods to musicians at any level. Learning is factual, playing is emotional. What is the mission of the Players School? If you come to this school and do what we tell you to do, you are going to play better, read better, and solo better. You are going to learn your instrument better, and you are going to be more knowledgeable about music off the instrument as well. 100% guaranteed. If anyone follows the teaching precepts of any teacher who knows the subject and is able to communicate facts about that subject, you are going to learn that subject. If the information is flawless, you are going to get better. We have almost a 100% improvement rate from every student we have ever had here at the Players School. It's not methods that I invented. These methods had been well established long before I subscribed to them. I guarantee you that if you do the work, you are going to get better as a guitar player, drummer, pianist, or bass player. The guarantee that no school can give you is that you are going to become the soloist that you want or a working musician. I can't guarantee that you are going to become a great jazz, rock, or blues artist. What I can guarantee is that you are going to increase your knowledge of music, your instrument, and the capability to relate to your instrument to perform the music that you are hearing on the instrument. Absolutely guaranteed. If you can play, you are going to be in a much better position to be heard and get hired as a player. No school can guarantee that you'll get work. It's impossible. If you do what the teachers instruct at the Players School, you will be a ten times better player by the time you leave. 100% guaranteed. We have students reading and soloing in two and a half months, more than a year ahead of any other school. Why? You can't overdose a student. He doesn't learn faster or better by giving him more work. He learns faster by giving him work that he can digest. How does the Players School differ from other music schools? We do not tell people that we will get them ready for the professional music industry. We get them ready to be players. We don't train for professional results. We train for musical results, and the side benefit of training for musical results is professional results. There are people who practice to get signed to a record deal. They are never going to get signed because they are playing exactly what they perceive to be the requirement to get those gigs. That means you don't get any better except up to that line. The way to do it is to learn your instrument with musicality in mind. That is the way every musician gets better. Every musician who is now famous at one time was not. At the time that they weren't famous, what were they doing? They did some things in music for themselves that gave them enough musicality to then become qualified, well-known, and respected. Everyone tries to get work, but you can't get work or become famous until you get good. I don't know if you will ever get work, but I do know that I will get you qualified to work, and qualified players are hard to find. It's a musical approach, not a professional one. What is the curriculum at the Players School? Are you personally involved with the education of each student? There is classwork that is on the instrument, and there is classwork that is off the instrument because a musician uses an instrument to represent what he hears. Music is melody, harmony, and rhythm so those are the elements you learn on and off the instrument. You will be involved in live playing ensembles four to five times per week along with chart reading. Even the non-readers read the charts because the notes are easy, and they can take the time to learn it. You'll receive two private lessons per week because one lesson simply isn't enough. You will also have a music principles class so you'll have a total of about nine to ten classes per week. With the private lessons, harmony, ear training, and learning the tunes of the live playing ensembles, you will have four basic requirements to practice every day. The Players School is a school for players based on your knowledge of your instrument and your knowledge of music at your pace. We don't rush you because rushing you is just going to frustrate you. Nobody gets beat up for making mistakes. Making mistakes here is important because everyone is going to make them so you should learn from them. Mistakes don't mean anything. You can make 10,000 mistakes, but on try 10,001 you are going to get it and that is what you are working for. When you make a mistake, you then know exactly what to fix. I'm personally involved with the staff and students because I have to be. Not everybody thinks like me, and I want to make sure we are all on the same track. The instructors here aren't well-known, but they are good, solid musicians full of information. You don't need to study with Stanley Clarke. You need to study with the guy that taught him. What are the most common deficiencies among entering students at the Players School that you see as an instructor? What do you believe has contributed to this? The deficiencies are based upon the student's beliefs. There is a commonality in learning music because we all learn the same way. Everyone has to learn what an "A" looks like in standard notation. What is unique about that? There is nothing that is unique about it. Where we differ is when we start to individualize our styles as developing musicians. Students come in afraid to make mistakes, just terrified to make mistakes. I know what students are going to do before they do it, and it turns out how I expect it to almost everytime. Like I said, when it comes to music, you can take my word as gospel. Anything else I suggest you can question. The biggest contribution to these deficiencies is that people read guitar magazines, and they believe the information. Do you have any advice on how to improve one's sight reading ability? The best way to improve your sight reading ability is to not practice it. Many people will read something, get through it, and then turn the page. You do not learn sight reading by doing that. You learn sight reading by reviewing the piece of music 50 times and then turning the page. Reading has always been based on review. It is just like learning to read as a kid. Stories were read, reviewed, and homework was assigned. It was always about reviewing the content. You can't read what you don't know, and therefore you have to review your reading in order to know it. What do you believe are the most essential skills that every aspiring bassist must possess in order to maintain a career as a professional musician? Since the majority of musicians are for hire, the way to sustain a career in this industry is to give the leader what he wants. What you need to figure out is what that is. I will tell you. It's good time, good tone, good note choices, and good feel. Those are the requirements. You give leaders those things, and you will work forever. Most gigs don't require bass solos. They require bass playing. You have worked with some of the most highly revered players in the music industry including Bill Bruford, Gary Burton, the Brecker brothers, Al Di Meola, John McLaughlin, Mike Stern, and Pat Metheny to name just a few. What do you believe has contributed the most to your success in maintaining such longevity? Two things. I think it is often due to my controversy and the fact that I stand for something. I also approach the bass a little differently and that might be another reason. In analyzing your own evolution as a musician, how have you matured? My grasp of tonality and my ability to spell it out has matured. In the 1970's, I had a lot of technique with little harmony to go with it. Now, I have the harmony, and it has a reason. When I was younger, I was an immature bass player because I based my career on the fact that I could play fast. Now my attention is heavily focused on music not of bass players. By studying all the horn players, pianists, and guitarists that I have listened to, it has made me into what I consider the most mature and capable bass player I've ever been in my whole career. While other bassists have chosen to play fretless, 5 and 6-string, piccolo, and upright basses, you have predominantly played 4-string fretted electric basses your entire career. Have you always heard the 4-string fretted as your specific voice? What are your thoughts on extended range instruments (6+ strings)? I've stayed with four strings because to me it is the entire universe. If I played a 5 or 6-string bass with a higher string, to my own personal ear, I'm no longer sounding like a bass player. What I like about the fact that I've stuck with a 4-string bass is that I'm still playing a bass instrument. Even with the high-pitched tone that I use on occasion, it's still a 4-string bass. With the 5 and 6-string, I recognize that the low string is a nice addition to the bass palette, but I don't hear the 6-string as an instrument that I personally enjoy, especially the high string. With the 7, 8, or 9-string, again it's a personal preference, I have no use for them, but other people do in their vision of music. On my 21-fretted neck, I have the whole universe here, and I have to learn how to navigate it. I have a standard joke that goes like this. There are many bass players that can't play the 4-string bass, but now with the addition of these extended range instruments, now these guys also can't play them either. This joke is based upon an ironic fact that these basses will never make you play better. Only what you know about music will allow you to play better. Can you tell us about your signature model bass made by Dean? What other gear do you like to use in the studio and live on stage? I'm now with Cort Guitars. I'm not at Dean anymore. I still admire them, but we had a difference of opinion on how to proceed so we shook hands goodbye and parted ways. I've always leaned toward the smaller to medium-size guitar company. I don't feel particularly compelled to play the $3,000 high-end instrument. It's personal, but I just don't believe I'm going to sound that much better. I was in Germany and a guy brought me a bass that weighed what seemed like a thousand pounds. It was astonishingly heavy. The tone was unbelievable, the most phenomenal sounding bass I have ever heard. I could never play it though because of the weight and construction. I prefer passive electronics. I don't like active electronics. I've never liked them. I like passive basses with alder bodies, a 21-fret neck, and Carl Thompson strings. Cort Guitars is making me a bass right now that will be a signature model. Plays great, feels great, and doesn't cost a lot, that is the bass for me. On Lumpy Jazz, I started out using bass amps. I realized that I didn't like the bass tones so I switched over to the Peavey guitar amp and got some of the best bass tones I have ever had. It was the bass amp that was muddying up my bass tone on a couple of the tunes. I haven't learned how to duplicate that recorded sound live so I have to go back to the bass amp setup for live performances. I'm working on it though, and I have some plans for a new amp. I don't know if I could use the guitar amp on the road because there just isn't enough low end, but in the studio it's perfect. I'm not affiliated with any amp company right now. I'm playing a Crate amp which I love because it's very simple. I like amps that have a slight rattle to them. I don't like tight amps. I don't like any amps that have a built-in sound. I'd much rather play through equipment where the neutrality of the amp is evident and it allows you to produce a sound that is you. 15-inch speakers without a tweeter and combo amps that have a good solid sound are what I prefer. I've been using Carl Thompson strings for over thirty years. Carl Thompson, nickel-wound, .040-.060-.080-.100 gauge strings are the perfect strings for me. With the proliferation of the internet over the past few years, many new methods of studying music have emerged including online music schools and one-on-one web cam lessons. How do you feel about the current state of music education? If the content is meaningful, it's good. If the content isn't, it is a waste of time. If people have the opportunity in this modern technical era to spread the word about education, hopefully the education has some basic value to be spread. Now that you have finished work on Lumpy Jazz, what is next? Will you be touring to promote the new recording? Are there any other projects that you are working on? There's quite a bit happening. My band will be touring a lot. We'll be going to Hong Kong, Portugal, Tunisia, and Guatemala. I've also been offered to do another record by King Records in Japan in the fall so I'm writing for that right now. It will be jazz/rock in style. Do you have any non-musical hobbies? Are you still boxing? I haven't sparred in about four or five months because I hurt my neck in working out. I jump rope and hit the bags. I really love the sport, but I'm a terrible boxer. I don't have the heart like these guys have. I can't get in there and rumble. I also love cooking. I really admire the great chefs and their ability to create so many different foods and flavors. What bass playing advice can you give to our viewers? If you want to be a better bass player and really a better musician, you have to pursue it. That means you are going to have to look into doing things and practicing things that don't emotionally mean anything to you. If you can get by the fact that you'll be working on music that will probably upset you a little bit, you are going to be five times the bass player in six months. You won't even know how it happens because learning is incremental. It's a million little moments of incremental improvement, and that's how a musician gets better. If you want to get better, you have to do things that you didn't count on doing.